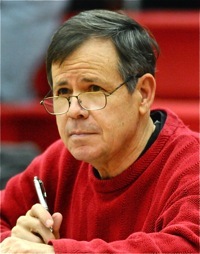 Doug Harris was a sports writer for the Dayton Daily News from 1997-2013, covering Ohio State football and University of Dayton basketball. He won the Associated Press award for the best game story in Ohio for his coverage of the Buckeyes’ 2002 national championship win. He also won numerous state AP awards during his 10 years at the Springfield News-Sun. He was a four-year UD varsity basketball player, starting at guard in 1976-77 and serving as co-captain in 1978-79. Between his newspaper stints, he served for seven years as an area director for Young Life, an international Christian outreach ministry. He and his wife Dott live in Springfield and have two grown daughters and seven grandchildren. Burrow and Haskins have productive days in spring game … Buckeyes probably could thrive with either player at the position … Meyer says decision could come in the next week. COLUMBUS — Ohio State fans are a different breed. Despite the threat of a torrential downpour and two days of forecasts so dire that Michigan and others cancelled their public scrimmages, a crowd of 47,803 showed up at Ohio Stadium to watch a spring game many thought might never be played. Those diehards didn’t need their umbrellas — the rain came right after the game ended and “Carmen Ohio” was sung — and they saw plenty of plays that had them oohing and aahing. But if they were looking for some clarity at the quarterback position, they probably went home a tad disappointed. All three potential starters had their moments in the pass-happy affair Saturday. You actually could see each of them starting at a big-time program. But no one stood out enough to name him the definitive starter. Fourth-year junior Joe Burrow had the best numbers. He went 15-of-22 for 238 yards and two touchdowns, including one completion to himself on a batted ball. He also looked at ease running the read option, and Urban Meyer wouldn’t have stuck with J.T. Barrett through his many ups and downs if the threat of the QB run wasn’t a priority. And as the candidate with the most time in the program, he appeared to have the most poise in the pocket (although he didn’t have to worry about being hit since the teams were playing two-handed touch). His final completion actually came after the fourth quarter ended. The extra snap occurred because he was “sacked” on the previous play and Meyer didn’t want the day to end on a downer. Burrow hit Demario McCall on a 42-yard TD just inside the pylon. Third-year sophomore Dwayne Haskins, who, like Burrow, was going against the first-team defense, has the biggest upside with a seemingly NFL-caliber arm. He threw a heat-seeking missile to Jaylen Harris for a 25-yard TD while finishing 9-of-19 for 120 yards and two scores. And redshirt freshman Tate Martell showed some elusiveness the others lack. He had 11 carries for 69 yards (it would have been more if he had to be tackled), and, playing mostly against the second-string defense, he was 5-for-16 passing for 28 yards with the day’s only interception. He looked like a quicker version of Barrett, but would Meyer really want to sign up for four more years of that? He probably should count on a rebellion from fans if he goes that route. 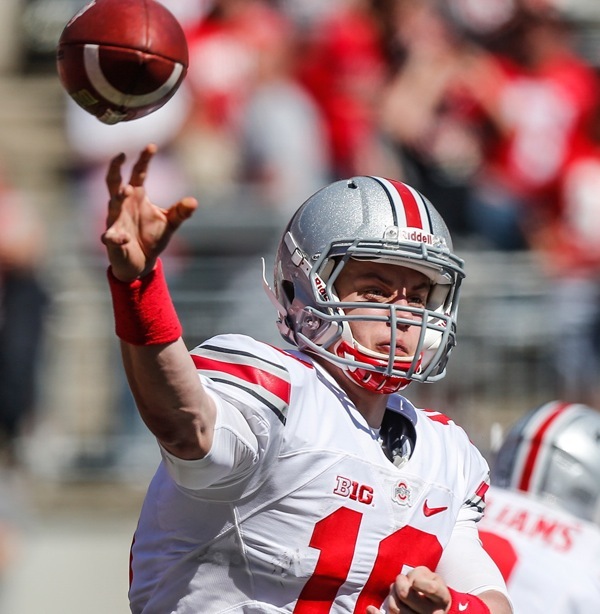 What might help in assessing the QBs is to remember what Meyer values. Here are the factors he uses in order of importance: competitive spirit, toughness, ability to lead, intelligence and knack for extending a play. Who are we to quibble with a three-time national-championship coach, but shouldn’t throwing ability be somewhere on that list? Are there five things more important than that? Really? As for naming a starter, Meyer indicated we may not have to wait until preseason camp for that. “Joe Burrow and Dwayne Haskins are competing now, along with Tate. We have recruiting this weekend, but Monday and Tuesday we’re going to have some productive meetings. I want to see the statistical data — we charted everything this spring — and go from there,” Meyer said. Hard to read intangibles when you’re sitting in C deck or the press box, which is why the competition still seems so murky. But Meyer really can’t go wrong no matter who he picks. Yes, heart certainly is vital, as he points out, and the guy who wins the job will also have an effective arm as well as the best ticker. The McKinley Funeral Home of Lucasville, Ohio, proudly supports Ohio State sports on Press Pros.